If the price of Apple’s new MacBook Pros made your eyes water and your wallet cringe when the refreshed range was revealed last week, you certainly weren’t alone. But fortunately, there’s some heartening news on the cost front courtesy of the rumor mill, which insists that price cuts are planned for the second half of 2017 alongside a hardware refresh of the notebooks. This comes from one of the most respected analysts on the Apple front, Ming-Chi Kuo of KGI Securities. 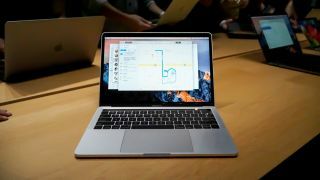 As spotted by 9 to 5 Mac, Kuo reckons that the next MacBook Pro refresh will come in the latter half of next year – presumably the autumn, as that would be business as usual – and that Apple will offer an option for 32GB of system memory with the new models. That would address one of the sticking points with the freshly unveiled Pros, with some folks being unhappy that you can no longer specify 32GB of RAM (apparently due to power issues – such is the price of ever thinner and lighter notebooks when it comes to trying to fit a beefy enough battery inside). However, whether this happens will depend on whether Intel’s Cannonlake CPUs arrive in time, according to Kuo, as this will offer the necessary boost in power efficiency to make the larger quantity of RAM viable. At any rate, we can look forward to some kind of internal hardware refresh, using Coffee Lake processors if Cannonlake doesn’t make it to production in time – and of course there’s also that aforementioned price cut, which with any luck will be a substantial one. As it is, if you want a MacBook Pro with the new Touch Bar on board, you’re looking at stumping up $1,799 (£1,749, AU$2,699) minimum for the 13-inch model. Those looking at the budget end of the MacBook range have also felt the pinch, with Apple ditching its cheapest MacBook Air (the 11-inch model). For us in the UK, this has meant that instead of being able to get a MacBook Air for £749, the cheapest model now available on the Apple Store is £949 – which is quite the hike (Brexit hasn’t helped on this front, either).